In 2015, Poland’s conservatives took power. In their position, the party began to reset progress, wiping elements of the country’s history to embellish a time before democracy. The response to that policy is Man with the Magic Box. Often slow, even ponderous, this didactic Polish import finds its power almost entirely on its themes. Set in 2030 Warsaw, the exhausted color saps the city of its power under a totalitarian, communist regime. Here, a small collection of characters struggle with their memories, seeking visions of a time when radio broadcasts weren’t censored. To its credit, Man with the Magic Box is engagingly detailed. Its dialog is careful and meaningful, requiring time for digestion. 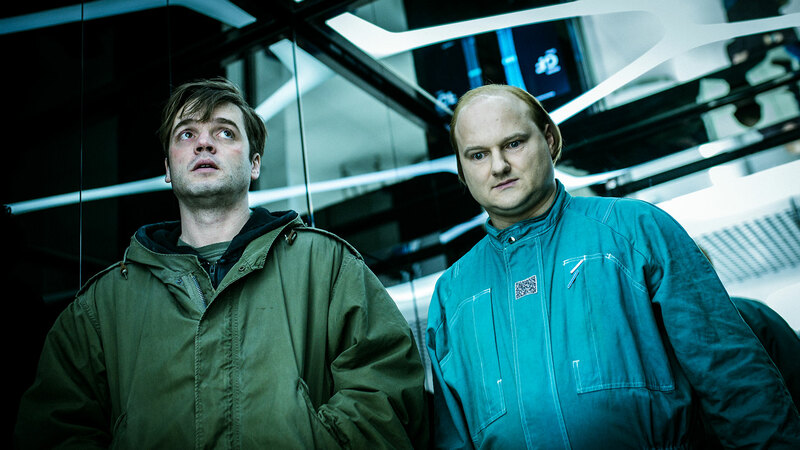 Eccentric and wordy, but equally visually enrapturing, Man with the Magic Box becomes an oddity where the depiction of a future Poland under the current elected regime is satisfyingly fertile, yet the plot winds around a potentially fatalist perspective without a solution. The idea is that love survives. Even after a memory wipe (“like Men in Black, 1997, Barry Levinson,” explains the hyper-Christian government agents, if not explaining how memory of an American sci-fi comedy persists when nothing else does), stars Olga Boladz and Pitor Polak find their way to one another. No government can stop human emotion. Details spill in from the background. TV broadcasts speak of nationalist propaganda. Militarism sets up defense against immigrants who may make Warsaw’s population sick; a passing car, via loudspeaker, shouts of various disease breakouts near the border. Polak sits through most of this stone-faced, blindsided by what’s become of his country. This, while attempting to fit together a past stolen by authorities. In flashback – or as the winding mystery of this plot only suggests, possibly time travel – Man with the Magic Box looks back at Poland’s post-WWI prosperity as an independent republic, and pre-Stalin. Happy times, with parties, dancers, and weird science involving Polak. There’s color here, in contrast to the drab, muted future scenario. It’s clean too. Future Warsaw covers its streets in trash, its buildings in disrepair. Given how blindsided the people seem, this did not happen slowly. Man with the Magic Box covers itself with idiosyncratic touches. A persistent vision depicts a woman with a cat head. Some graffiti artists dress in rabbit-like jump suits. An elderly woman living alongside Polak is never seen without her light-up sneakers. Those bits of light, including the glowing graffiti left by those kids, peek out from oppression. It’s a glimmer of what can be in a free society, that glimmer barely clinging on. As a piece of expressive work, Man with the Magic Box is all too critical of a current regime to write off. The offbeat, even outlandish touches give writer/director Bodo Kox a definitive identity and style, even from what appears like a micro budget. The idea of washing history and implanting a new reality speaks across continents. As an import, it presents a local cultural crisis, pleading for help. Getting to the end requires patience though. Or, maybe the lack of patience is making Man with the Magic Box’s point – it’s too easy too ignore what doesn’t hold our ever shrinking attention spans. That’s how control is lost. A Polish import, Man with the Magic Box is a critical examination of current policy under a weird veil of sci-fi unreality.